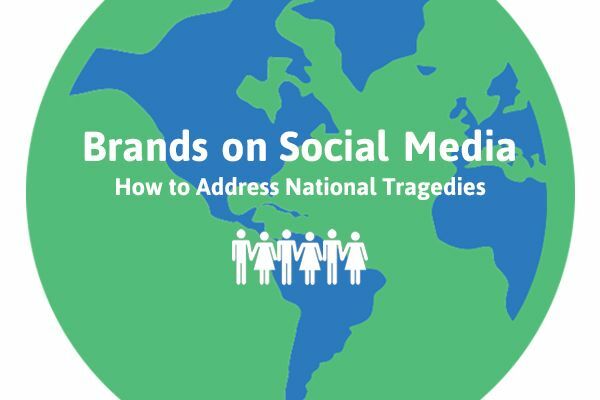 As a large franchise company that has an active presence on social media, we sometimes have varying opinions on addressing national tragedies. Other brands on social media have no doubt, at some point, also run into a similar dilemma. Addressing national tragedies on social media is a slippery slope. On one hand, a message of sympathy can be well-received and even comforting; on the other hand, it can backfire and work against the company. 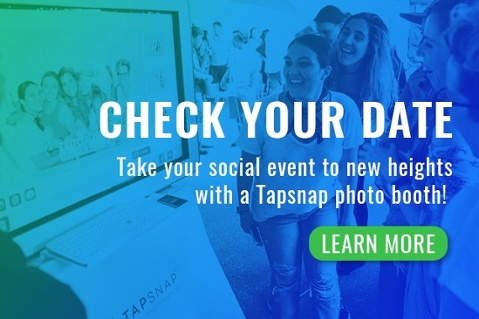 Much like guidelines on social media mistakes to avoid, there’s a barrage of social media best practices for brands offering guidance on addressing sensitive topics. However, these rules aren’t set in stone, giving way to gray areas. So, what are brands on social media supposed to do in light of a tragedy, or anniversary of one? The general rule of thumb observed is to avoid posting anything at all. Brands, however well-meaning, have received negative backlash for seeming ‘opportunistic’. Others misguidedly attempted to capitalize on tragic events. Before sending out a tweet, or a Facebook post, take a moment to pause and reflect on your branding. For some companies, it’s almost expected of them to express condolences. Of course, this depends on the industry, or what their brand stands for. Avoiding a scenario wherein your company comes across as opportunistic when tragedies strike should be top of mind. Nothing can be more damaging than obliviously posting to social media. A UK based fashion store, CelebBoutique, made the mistake of hopping on the trending hashtag #Aurora. What they didn’t realize was their seemingly clever tweet was actually connected to the tragic Aurora shooting in Colorado on July 20, 2012. The backlash resounded throughout social media, and CelebBoutique became the target of many angry Twitter users. Another innocent, but damaging tweet was sent out by Digiorno Pizza when they joined the trending hashtag #WhyIStayed. What the company didn’t realize was that the hashtag was associated with domestic abuse—a very serious topic not to be taken lightly. 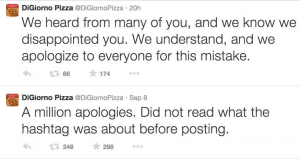 Much like CelebBoutique, Digiorno Pizza received a lot of heat from one unintentionally offensive tweet. These social media blunders by CelebBoutique and Digiorno Pizza, however innocent they were, teach us a valuable lesson: be aware of what you’re posting about. Before joining in on a trending topic, be sure you know more about it, and do your research. It’s also important for brands on social media to gather factual information before posting anything related to a tragedy—especially if it’s still breaking news. Social media gives power to the people, but it doesn’t ensure quality control. As a result, it’s important to be knowledgeable and accurate. If your company has decided to pay its respects over social media, ensure your humility as a company is evident. A big no-no is branding any collateral you make to accompany your tribute. This can come off as tasteless and disrespectful. It can also be interpreted as an attempt to capitalize on a tragic event simply for attention or engagement on social media. Remember, you’re not trying to promote your product—you’re expressing remorse, and you’re standing with your community. As mentioned, never tie in your message of sympathy with a promotion. Negative backlash will be imminent if that happens—even if by mistake. The reasons why should be obvious enough. National tragedies are trying times, and extra caution should be taken when posting to social media. Amongst many social media best practices for brands to follow during a difficult time is halting automated messages. This isn’t always necessary, but do consider keeping your posts to a minimum. Most importantly, revise your scheduled posts—what may have been appropriate before a tragedy may now be insensitive. Remember, tread with caution and be considerate of your content. During troubled times, there is little solace that can be offered to victims’ families and friends. However, your tweet or Facebook post can still make a difference. While a statement of support is appreciated, consider being proactive as well. Sharing valuable information and resources, such as where to donate or volunteer, will go a long way. If possible, consider starting your own charity drive or volunteer initiative, especially if your brand is connected to the tragedy. During a tragic event, there are no set rules for businesses. However, these social media best practices for brands should hopefully provide some guidance. The most important thing to remember is to be human! Our final advice: don’t be a robot, be compassionate, and show that you care.